Here is the weekly review of the top performing Argonauts alumni, who are currently playing in pro basketball. #1. 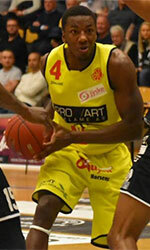 Darryl Tucker (6'7''-F-95, graduated '18, plays pro in Denmark) led Horsens IC to a victory against the third-ranked Vaerlose (3-12) 101-94 in the Danish BasketLigaen in Wednesday night's game. 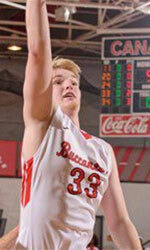 He had a double-double by scoring 14 points and getting 10 rebounds in 23 minutes; quite an impressive performance considering it's only Tucker's first season in pro basketball. It was the game of the round between two top 3 ranked teams in group ProA. Horsens IC (13-3) is placed second. It was his team's third consecutive victory in a row. It's Tucker's first year with the team. He has relatively good stats this season 12.3ppg, 5.6rpg, 1.1apg and 1.4spg in 16 games he played so far. #2. Experienced Reginald Warren (6'9''-F-81, graduated '03, plays in Japan) could not help Kagawa FA (7-25) in their last game on Saturday. Despite his very good performance the sixth-placed Kagawa FA (7-25) were defeated 83-74 at home by the higher-ranked Orange Vikings (#4) in the West group. 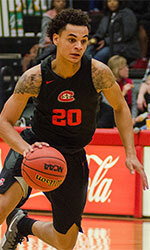 Warren recorded a double-double by scoring 16 points and getting 18 rebounds. He also added 3 assists and 2 blocks. The Regular Season already ended. Warren has individually a very good season with high stats. He averages 17.2ppg, 13.0rpg and 4.0apg. #3. Emanuele Montaguti (5'10''-PG-93, graduated '16, currently in Holland) was not able to help Rotterdam in their game against Zwolle (16-2) in the Dutch Eredivisie. It was not his best game last Sunday. Montaguti scored only 3 points in 12 minutes. Rotterdam was crushed 90-64 on the road by the second-ranked Zwolle. It was Rotterdam's fifth consecutive loss in a row. This year Montaguti averages 3.1ppg, 1.3rpg and 1.4apg in 14 games. #4. Jamal Clarke (6'9''-PF-98, graduated '17, plays pro in Spain) managed to help CB Valle de Egues to win against the 11th-ranked Univ.Valladolid (4-9) 85-70 in the Spanish EBA (fourth division) in Saturday night's game. He scored only 4 points. CB Valle de Egues (9-5) is placed fifth in Group A-A. It was his team's first victory after three consecutive loses. This season Clarke averages 5.5ppg and 4.5rpg. Notice: The list above includes only some of the University of West Florida alumni playing currently in pro basketball. Check COMPLETE LIST.